With every hour that ticks by on the clock, another American dies of oral cancer. That statistic equates to more than 9,500 deaths every year. According to the Oral Cancer Foundation, those numbers have not changed in more than 30 years despite the fact that fewer people smoke or chew tobacco, two behaviors that are proven links to the disease. Moreover, research has now found a connection between the human papilloma virus (HPV), which is sexually transmitted, and oral and throat cancer. For people diagnosed with this cancer, the five-year survival rate is barely more than 64 percent. Is there any good news? Yes. When oral cancer is found early rather than at a more advanced stage, the five-year survival rate increases to between 80 and 90 percent. 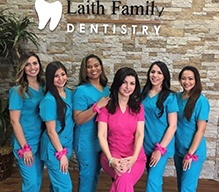 At Laith Family Dentistry in San Antonio, TX, we conduct oral cancer screenings at each one of your biannual dental checkups. Using VELscope®, an advanced cancer detection technology, we can find early signs and symptoms of the disease earlier. VELscope uses a special light to detect cancer and pre-cancers much sooner than is possible by eye inspection only. Using this technology, Dr. Kadamani and her staff look for tissue abnormalities. The harmless blue light of VELscope causes soft tissue in your mouth to naturally fluoresce. Normal tissue has a distinct pattern under the light of VELscope; this pattern can be noticeably different when there is an abnormal change, like when oral cancer is developing. VELscope is not intended to replace the visual and tactile examination of your mouth, head and neck, but rather to supplement these important components of an oral cancer screening.